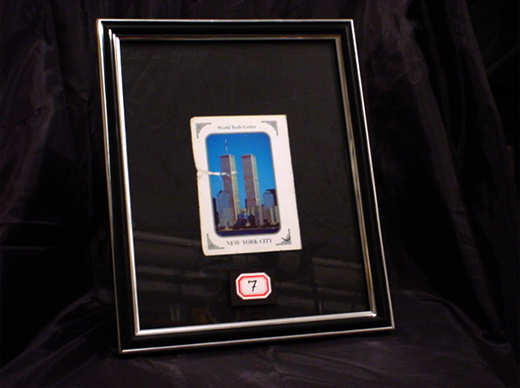 "I bought this card in Woodside, Queens after I walked with friends over the bridge from Manhattan that day. I felt sort of weird buying it - reacting to the events of the day with an act of commerce seemed almost blasphemous - but it still felt like the right thing to do. I had to fold it to put it in my wallet (an oversized tooled leather mexican thing, big enough to hold foreign currency) but once that was done, I didn't give it much thought. But in the months and years afterward, when I cleaned it out, I found I couldn't throw it away, or even put it away in my box of mementos. The tears are really just from being toted around for so long. I lose things all the time, but you know how it is, the things you think you'll surely lose because you don't need them wind up being the things you keep for the longest. Every time I opened up my wallet and cleaned it out, I would fold it back up, and put it back in. Mostly, I used it to divide business cards and membership cards, to keep security cards from demagnitizing credit cards, stuff like that. I figured I'd know what to do with it at some point. And, when [my friend] Emily told me about [this] project, I did."